Side from its many impressive Queen Anne elements, in a region that loved brick, the wood frame of this example sets it apart. Common style elements on this ca. 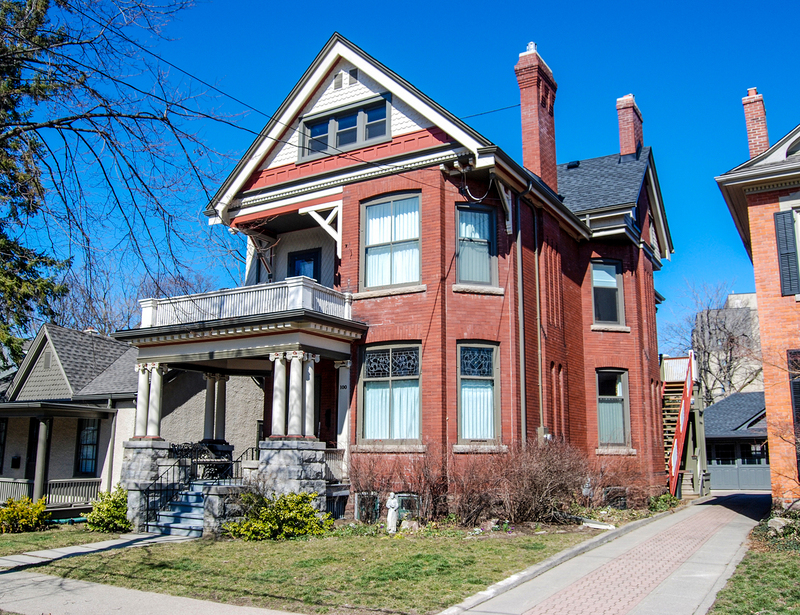 1880 house include: the hipped roof with lower cross gables (one forward facing); decorative brick work on the chimney(s); use of oriel (or cantilevered bay) windows and cutaway bays to interrupt flat surfaces; plus an expansive one storey porch that extends across part of the facade and down one side (which in other builds might have wrapped the entire facade and/or down both sides). A round, square or polygonal tower, usually on a corner of the facade, was de rigueur. This house shows a less common central placement of the interrupted (by the porch) polygonal tower topped by a copper clad onion cap and finial. The spindlework and cladding details, including the flared shingle band that wraps the house, bear a distinct US Queen Anne flavour. Note the curved glass in the oriel (something that has been very rarely been replicated since) and stained glass inserts. Overall, a stunning Queen Anne design. Not all Queen Anne homes were towered and prominently decorated. In fact, the majority of Queen Anne houses built in Canadian towns and cities leaned toward the more reserved designs of the English school. 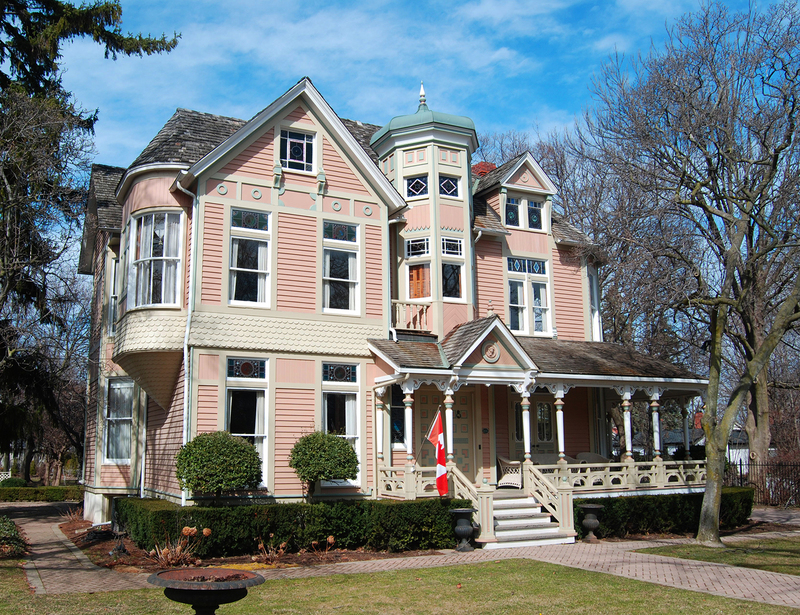 This circa 1890 home is representative of the demure Queen Anne. Asymmetrical, the facade is dominated by the two storey bay which rises into a full width front facing gable defined by dentiled moulding with panel moulding above, fishscale shingles, a banded (ribbon) window opening and brackets supporting the overhanging portion above the portico. Tall, molded chimneys with decorative brickwork rise above the high pitched roof. On the right wall, another two storey bay rises beneath a cross gable, while on the left side (see inset photo below) a second storey cantilevered cross gable, entirely clad in diamond shingles, is supported by brackets; both of which interrupt what might otherwise be flat surfaces. 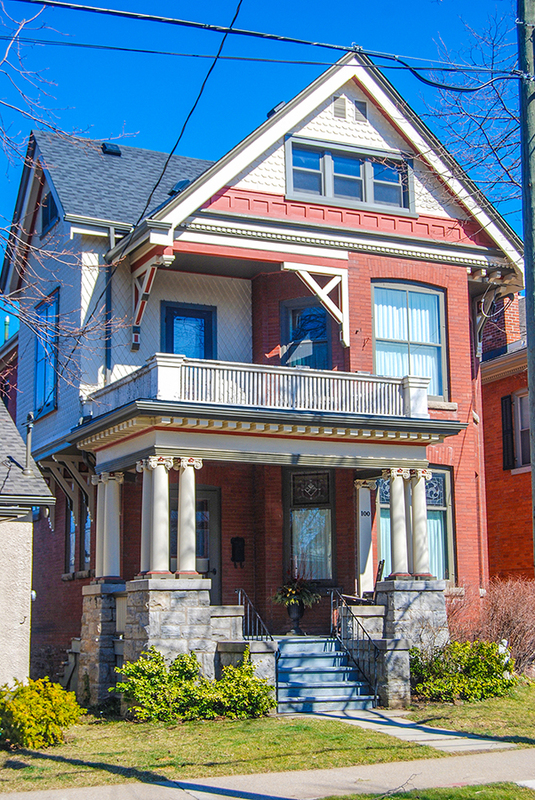 A classically inspired portico, with a faux balcony above, shelters the front entry. Here, as in most English designs, it is the use of multiple complementary elements that work together to produce the “decorated house” which typify the Queen Anne style.